In the midst of today’s busy “TmoNews” day, Asustek has come out and refuted reports that the Garminfone isn’t selling well. While they declined to discuss exact numbers, Asustek claimed that the shipments of the phone were selling “as previously planned.” They also claim to have received positive feedback on the device from the marketplace. I guess we can just say, it’s a niche phone and I’m sure those who purchased it had good reason to do so! ← T-Mobile’s First HSPA+ Capable Handset Coming September? I never considered buying this phone… it’s a very nice phone; glad it’s selling perfectly then…lol. What does this do that any 1.6 android phone and gmaps navigation doesn’t do? It actually connects to the Garmin satellites. The navigation on this phone is by and far better than the nav on other phones (although the ovi maps is pretty good). It’s much more user friendly and the layout is less likely to confuse a driver who may have a naturally poor sense of direction. While other phones have GPS (or assisted gps) that work perfectly well for most consumers, this one is just much more dependable. It’s a great phone, but as the article states, it’s a niche phone. Not for everybody, but the folks who have it love it. I think poor sales had more to do with the original price point. Well, it doesn’t connect to the “Garmin” satellites because Garmin doesn’t have any satellites. Like nearly all phones with GPS capabilities, the garminfone uses assisted or direct GPS using the Department of Defense’s GPS satellites to determine its location. Using the location, it then calculates a route using its onboard maps, maps from the Garmin servers (obtained over the wireless network), or a combination. What is different about the garminfone is that it has onboard map data, either provided with the shipped handset or via download. This means that the garminfone can do a route even if the handset is out-of-range from T-mobile’s wireless network. In comparison, the Garmin mobile app running on my Blackberry only uses map data sent in real time over the wireless network. Garmin mobile provides a lot of the added functionality of the garminfone but it will not work if it is out-of-range of the wireless network. Thus, the garminfone is a considerably more powerful GPS device than most phones. The user can obtain a lot of routing capability with, say, Google maps on an android phone or with the aforementioned Garmin mobile app on a Blackberry, but if the user is out of range, he is hosed and has to get a folding map or ask for directions. Personally I’ve had bad experiences with Google Maps on my MyTouch. I find some of the routes to have unnecessary detours. I almost got into an accident one time coming back from LAX. Coming from the 105 it told me to go 605 North, but at less than .1 miles from the onramp it then suddenly re-routed and told me to take the 605 South. That was an extremely dangerous situation. Perhaps it was a glitch, but I’m thinking about reporting it to Google somehow. Anyways I’m sure the GPS in the Garminfone is better. My dad loves his phone! are you serious right now?? Thanks. I’m ok in Java. There may be some errors in that code I wrote. Well if their plan was to sell 25 of these phones then its going just fine! It’s easy to meet your expectations when you set your expectations low enough. lol, funny how you people judge phone sales because your judgment is clouded by what kind of phone you like. believe or not people do buy phones that are simple like this – perfect navigation device + low end smartphone… its not an iphone, droid or evo, but it targets those people that doesn’t want an iphone, droid or evo. I usually don’t buy electronic stuff.til somebody else has tested and have gotten the bugs out.I think it has more internal memory than my cliq.its an ok unit.I like the gps on satellite.I don’t like the fact that it doesn’t have some kind of led indicator.to let you be aware that you have a message.not worth the 400.dollars .plus I kept it longer than the 14day buyer remorse period. This phone is #1 in the “70 year old men driving RVs” and stalker demographics. Actually, you are paying for a fully functional hand held Garmin GPS, loaded with Garmin’s maps, that also makes phone calls and has web access. You aren’t paying for a gaming unit. all of which I can get with google maps, Ovi Maps and Bing for free. So explain why it’s priced so high again? Without a data connection, Google maps, Bing and Ovi won’t work. This will. I’m not talking about a data plan, but a data CONNECTION. They do not have a true full gps. This does. It also contains Garmin’s full, accurate, expensive maps, which are far more accurate than the others. If you are hiking in the mountains, in the middle of nowhere, with no signal at all, this will still function as a gps. No other phone will. Go price a full color Garmin gps with these features and se what you find. Subtract the GPS feature that I can get from a $100 Dedicated unit and your just left with a low spec’d, dead on delivery OS phone with a mediocer processor, low ram/rom, low end Megapixels but with a reasonably sized screen. Mineswell be the Behold II with real GPS. Stop being a troll, pimpstrong. Your Behold 2 won’t have a real gps. No phone does. Just because it isn’t for you, doesn’t mean a market doesn’t exist. Not everyone drives a Ferrari, so they make other cars, too. Any phone you get will be outdated before it hits the shelves. Something better will always come along. I guess you just throw away $500 every 2 months on a new phone. What a loser. Before I picked up my MT3GS, this was the phone I was going to get…until I learned it would be weighed down and stuck with Android 1.6. If this phone was given 2.1 or 2.2, I would consider shelling out full price for it. It is an attractive phone…but who wants a new phone with old software? 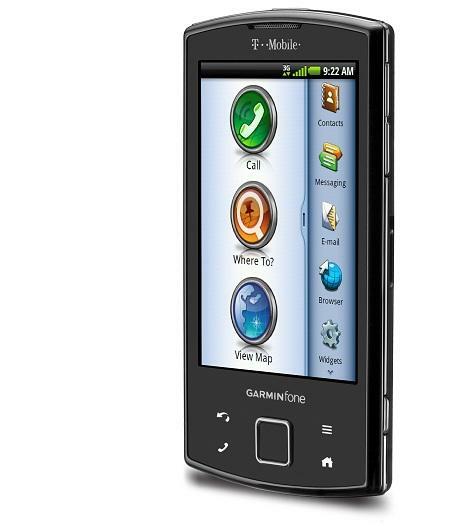 The garminfone is now listed at $99.99 on the T-mobile website for upgrades and a 2-year extension. Looks like a fire sale to me; without the extension, the phone is $449.99, the same price as the HD2, which is still listed at $199.99 for the 2-year run. $99.99 is a good price for the garminfone. WOW! they listened! and i guess they seen the low sale numbers.. now its at a more attractive price. I have had the GF since it was released and it has FAR exceeded my expectations..! We have 3 in the family..! All are VERY happy. Even my friend with a new iPhone was super impressed if not disappointed his phone couldn’t do all that my GF could..! Ha..! All in all, it is a hit in my book. The Android OS and breeze UI has been great. Battery life has been good and you have 3 options for charging so this should not be an issue. I don’t miss my BB 9700 at all. All I want and expect is for Garmin and TM to keep the OS up to date in terms of updates. If this happens I will be totally happy. But as of now I am nothing but a GF FAN….!!! Nicely written. Nice to know that not all need/want what is next just because it is next. Get what you need! Enjoy it! I agree – I got this day it was released and have not regretted it once. (Well, I did regret not knowing about the Father’s Day deal, c’est la vie.) I’ve used almost every feature of this phone and love it. I wish it were marketed better; there are a LOT of people intimitated by the Android OS (not on this blog, of course) and the GF OS makes it very easy to work with. Pricing could be better but overall its a pretty good gps/phone. Battery life is great even on heavy usage. It might not have the most updated OS but its still pretty decent and easy to use. Think of it this way, there has been stories about robbers breaking into cars stealing GPS devices. Now that its a all in one, you would never leave it in the car and have less chances of your car getting broken into. its at 129.99 now.. THEY LISTENED! and seen those low sales numbers. All the regular droid fans are saying why do i need this? I have googlemaps, but I have the garmin app on my hd2, and the nav rocks!, route recalculating is super fast, within 1-2 seconds of making a different turn. Plus you can use it without where there is no data signal. I’m not sure about the Garmin phone, but with my HD2+garmin, I could pop in a pre-paid sim, and still use the nav features without a data line. 129.99 is a good price point. I bought this phone when it first came out and its a piece of crap. The phone is like the Tap but with Android, this i the WORST Android phone ive ever seen EVER!!! Thank goodness that there are other options!!!! Its a nice phone. i considered buying one but the price is too much. even at 129.99 its still too much. with android catching up with apple and blackberry, the use of google maps with TTS comes into mind. i have a friend who has the 1.6 android and his google maps has TTS. its all the same. it will still take you where you want to go. scary times for garmin indeed. I had a chance to play with one–it feels very good in the hand. Borg is dead on. Virtually every other cellphone on the market only have cell tower radio assisted GPS (aGPS) as opposed to the dedicated satellite signal only GPS circuitry found in hiking and marine GPS recievers. If you’re in a part of the globe whose cell tower is unable to transmit the ephemeris (among other things) to an aGPS limited phone then applications like Google Maps can only tell you where you are within of give or take a several hundred meter radius. That makes the situation worthless for street navigation programs that need the accuracy. This happened to me while I was in a major city like Manila in the Philippines a couple of years ago. That renders positional accuracy of street nav programs like Google Maps hosed unless you were able to talk to NavStar in orbit above without having to rely on antiquated or non-existant cell towers and aGPS. Last, but not least, pairing the cellphone with a BlueTooth GPS reciever or datalogger was needed in order to stream the satellite data to the nav app. Only after doing so did gain me real-time positional accuracy down to a few meters. Bring the price down to $99 with no contract and I’ll buy it.